Nathan McEuen recently wrapped up production on his sixth solo album called, “Side by Side.” I’d been hearing about a pending upcoming release for the past year after he started a Tuesday evening residency at Amigos in early 2014. I made it a point to stop in on a dozen or so occasions to check it out; Nathan has this sort of shy, witty charm about him that is quite endearing. I quickly came to know by heart the inspiration behind the banjo he played. In a nutshell, it’s a gift from Russi Taylor, the voice of Mini Mouse. The banjo belonged to her late husband Wayne Allwine, the voice of Mickey Mouse. It’s a lovely story with a delightful song written in thanks for the honor of being the recipient of this gift. But as quaint as that is, you really need to read the liner notes behind Taylor’s inspiration and the song, “Pictures of You in My Heart”. There’s no doubt about it, Nathan has heart and it certainly comes through in his writing and music. 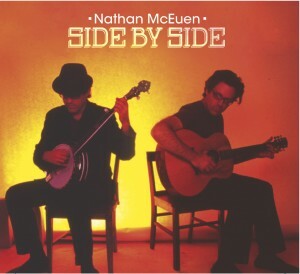 Nathan’s record, “Side by Side” features six tracks out of ten on the banjo, an instrument he said he just picked up a few years ago (I did mention he has talent, right?). The remaining four songs are Folk – Americana and not only feature his guitar work, but he brings to the table the amazing Jesse Siebenberg, who helped co-produce this one in part at Brotheryn Studios. Other musician credits to note: Randy Tico on upright bass; Jesse Olema on fiddle; Ashley Broder on mandolin; Samantha Harvey on accordian; Craig Eastman onfiddle, Chris Caswell strings and piano; Marcy Vaj on violin and viola; Jeness Johnson on cello and as mentioned previously Jesse Siebenberg B-3, bass, drums, slide guitar and BG vox. My own personal protocol when it comes to reviewing an album is that I spend some time with it. A lot of time. I’ll listen while driving around, I’ll listen while working at my computer, and I’ll sit there doing nothing else but paying attention to detail. The great thing about Nathan’s “Side by Side” is that I was already familiar with most of his songs and now I had the chance to learn the lyrics and hear what his songs sound like with a full band behind him. But I know an artist has passed my own personal acid test when I find myself whistling or singing a line from one of their songs. “Side by Side” has passed with flying colors. But am I always up to no good? “Up to No Good” is my favorite track but I’ve found myself humming to all his lyrics and I have a new found love for “Pictures of You in My Heart” after learning the true life back story on it. Nathan does justice to their love story. I recommend picking this one up the next time you see him or on his website. The CD will get a broader distribution in a few months. I sat down with Nathan at Amigo’s the night before leaving for a few weeks taking his new material on the road for shows in the Colorado Rockies, Idaho, Utah. Ventura Rocks: How long have you been working on material for this one? Nathan: Probably about a good year and a half. VR: What inspires you to start writing? Nathan: I started writing as a child when I was about eight years old simply because I was surrounded by a bunch of people who wrote songs and it was such a cool thing to create something out of nothing. VR: Are you always writing material? Nathan: Absolutely. Today before the show, I had a songwriting session in Thousand Oaks even though I just released an album, I’m already working on my next one, actually two of them. VR: I recall when we spoke last year you had different types of material, some harder than others, like the Foo Fighters? Nathan: Well, in the stylings of…I didn’t want to release an album with five different genres on it; that would be too difficult to explain to people, so the first one I ended up putting out an album with banjo and guitar. Half of it’s banjo instrumentals and joined with a bunch of other musicians that range from an upright bass, mandolin, fiddles and a little bit of percussion that go around the banjo. The other half is singer songwriter fully produced full band material. so this album is a cool complete contrast. half of it’s instrumental and the other half singer songwriter. That was a lot of fun and it seems to be going over really great at live shows playing the banjo then singer songwriter thing. It’s a fun blend. VR: I don’t know that I was a fan of the banjo before, but watching you play the past year it’s in my realm of reality now and I’ve really begun to appreciate it, even dig it. Nathan: It’s definitely an acquired taste. VR: I sit there and watch you picking, it’s amazing. Let me see your fingers!. VR: (Inspecting Nathan’s fingers) Oh my god (impressed). Nathan: Yeah they’re calloused a little bit. VR: How long have you been playing the banjo? Nathan: A solid four years. I grew up with a banjo playing father which a lot of people know, and some people don’t. People might assume I started playing it at a young age, but no, we kind of out of respect for my father, my brothers and I, and even my sister, we kind of decided to not play the banjo for a long time for various reasons. But four years ago I started finding my own voice on the banjo and I started writing a bunch of songs. VR: What does your dad think about that? Nathan: And it’s nice because I can’t play like he does. It’s fun thing because it’s not like I’m copying him. VR: Right, it’s your own style. Nathan: And there are some things that I think he’s very proud of just to say the least. 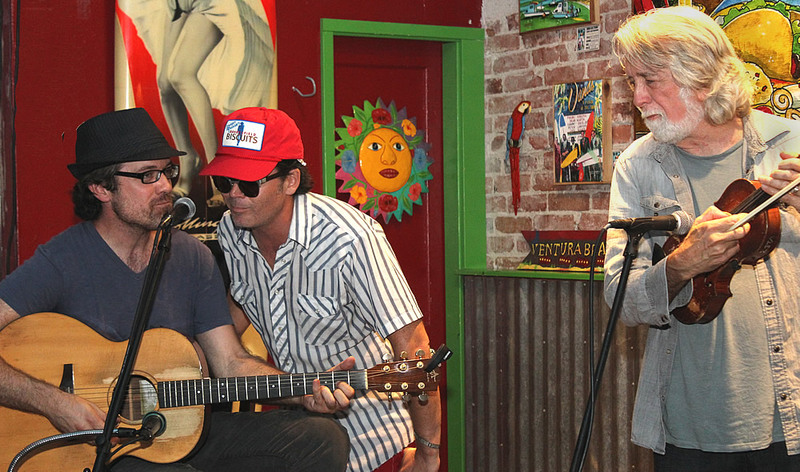 VR: Well I was here (at Amigo’s) that night when your brother Jonathan and your dad joined you for a couple of songs. Nathan: That was so much fun, and that was a very rare moment. He just happened to be passing through town. VR: I was just sitting there watching the three of you and it was clear, you could see the genuine affection that you all have for one another. Nathan: Yep. (pauses) It definitely, runs deep in our family. VR: So where did you record this one? Nathan: Mainly I recorded it in Southern California between the Valley and LA; it’s simply a guy who has a studio in his back yard. And I recorded the majority of the banjo instrumentals there. The majority of the singer songwriter part was in Ojai at Brotheryn Studios, and a couple of studios in between. Once tracked needed a string quartet so I recorded that in Venice. The first song that I ever tracked for this album actually was tracked in Atlanta, Georgia called Tree Sounds Studios. So I started in the East Coast actually and then brought it to the West Coast. VR: When mixing the album did it sound like it was recorded in different places? Nathan: Well the whole point is to have contrast. 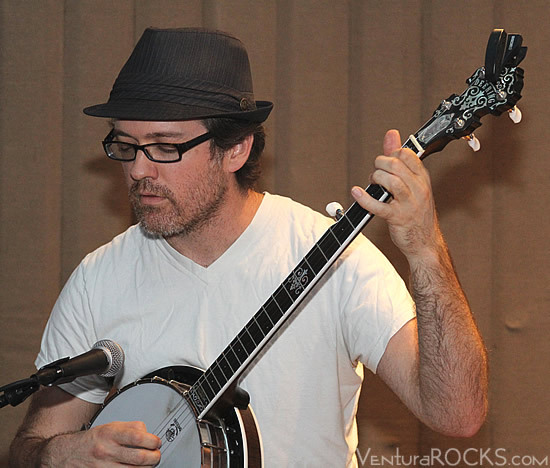 I didn’t want the banjo to sound exactly like the produced singer songwriting stuff. So there’s a continuity between the songs, but there is a drastic change halfway through the album people will notice, but it seems to flow. Nathan: I produced most of it. The last half I co-produced with a friend of mine, Jesse Siebenberg. I had other executive producers, but they took care of financing. But Jesse was producer with me the last four tracks, and I produced the rest of it. VR: He plays on it as well? Nathan: Yes. Jesse is an animal in the studio; a lot of people who work with him know him to play everything it seems. But on this album in particular he is playing – between the four tracks – some slide, the bass the drum, keyboards, and singing background vocals even! We had a great time, we just got a lot of work done. A majority of those songs we got done very quickly and once we got to the point where we needed to add strings, it was just very easy because we worked so well. He’s easy to work with. VR: He’s a pro. Very talented. VR: And you have your own label? Nathan: Yes, my own label with six solo albums out now. I’ve been acting as my own label for the whole thing; some days it’s answering the phones, and some days it’s emptying the trash and other days playing songs on the stage. It’s been fun keeping it going, but I am looking to partner up with people who see the vision and the grand picture but I can still act as my own label and pay for all the recording, but partnering up with a distribution company will be very beneficial for me.